Maxi Cosi AxissFix Plus i-Size Car Seat provides state-of-the-art safety performance, by complying with the latest i-Size car seat legislation. Featuring a 360 degree swivelling seat, securing your baby is easy. The Maxi Cosi AxissFix Plus i-Size Car Seat allows front-on access by just turning the seat towards you. Within seconds you can buckle up your child and rotate the seat into the correct travel position. Why should I choose the Maxi Cosi AxissFix Plus i-Size Car Seat? The Maxi Cosi AxissFix Plus i-Size Car Seat has a 360 degrees swivel seat suitable from birth to approximately 4 years. It complies with the latest i-Size car seat regulations (R129) with ISOfix installation system and top tether. The rotating seat makes placing and securing your baby into the seat easier. Rearward facing up to approximately 2 years (87cm) and forward facing up to approximately 4 years (105cm). Your baby will be kept comfortable in this Maxi Coat Car Seat by the cosy cocooning inlay for newborns to approximately 4 months (45cm - 60cm). This inlay ensures that your baby is as safe as possible whilst adding to their comfort. This i-Size Car Seat features 4 recline positions will also make sure your baby stays comfortable on your travels. High and padded car seat with a 5 point safety harness. The headrest has high performance impact-absorbing material, with excellent side protection system offers optimum head and neck protection! Additionally, the anti slip harness provides restraint during the event of an unlikely frontal impact. The Maxi Cosi AxissFix Plus i-Size Car Seat features an A.S.B (Automatic Safety Belt) system which keeps the connection between the seat and base. Colour coded indicators ensure correct installation. As well as this, the cleverly routed top tether straps give easy access to your baby from either side of the car. The head rest and harness adjust simultaneously into 7 different positions. This means that this car seat will be extremely easy to use! Belt hooks keep the harness open while you secure your wriggly little monster into the seat. Last but not least, a central dashboard allows you to select which facing mode you require, all whilst the covers are easily removable and washable in case of any inevitable spills! 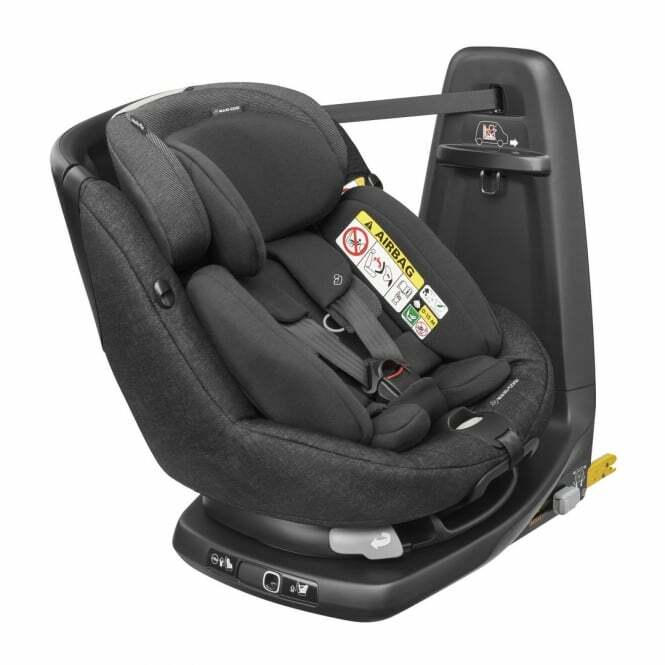 What are the specifications for the Maxi Cosi AxissFix Plus i-Size Car Seat? Is there a Manufacturers warranty for the Maxi Cosi AxissFix Plus i-Size Car Seat? Maxi Cosi offer a Lifetime Warranty on products - you must register within 3 months of purchase. A 2 year Warranty is offered if Lifetime Warranty is not applicable. This applies to UK mainland only. *Please reference Maxi-Cosi Car Fitting List to ensure that the product is suitable for your vehicle. Is there a review for the Maxi Cosi AxissFix Plus i-Size Car Seat? Showing our 4 Maxi Cosi AxissFix Plus i-Size Car Seat reviews with an average rating of Excellent. Would you like to write a review? Your Review - Baby seems so comfortable in his new car seat. So glad we made the switch. Very easy to fit and use. Would recommend. Your Review - This seat is very comfy for my son, and the swivel means that it's so easy to get him in and out. I especially love the strap holders which pull the straps back when not in use. I hesitated buying this initially as I read some people had issues with their baby's head falling forward when asleep. Despite our son being 9 months old, we went with the Plus model as the recline is greater. He did once fall asleep when it wasn't fully reclined, and his head did indeed fall forward. It's a great seat though and I'd buy it again. Although it was at the top of our price bracket, it has been by far the best and most useful item we have brought. The safety rating of it made us purchase and we wouldn't swap it for something cheaper since using it. I can fit it very quickly and it doesn't need checking every time you go out. We really find this car seat great when our little girl falls asleep, by being able to turn her around and not manoeuvre her too much she now doesn't often wake up when coming inside. Our main worry was being able to fit the car seat but it turned out to be very simple with colour guides and pictures to help. Our favourite feature is how the seat turns when you're putting your child inside. We've had other car seats that often end with bumped heads but this has totally eliminated that. It also means that you can clearly see if they're strapped in correctly. We couldn't imagine not having this car seat now, and have been spreading the word about how good it is.